Religious Regalia is the latest entry in the Beginner Baubles line. Released monthly, each new issue in the series is packed to bursting with weird and wonderful prizes just waiting to be greedily devoured by the gluttons at your table. 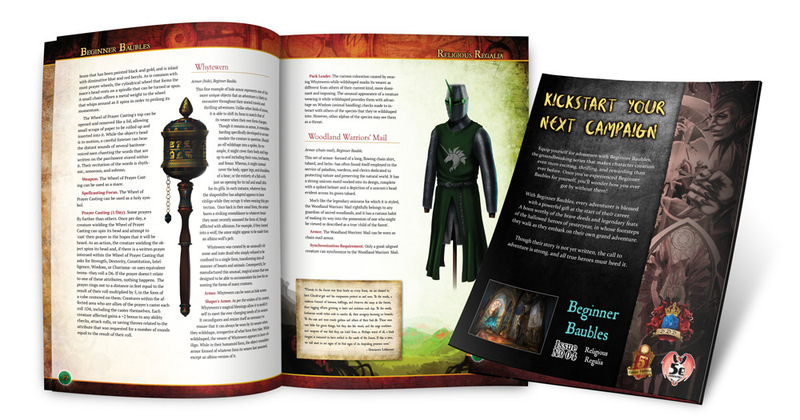 In addition to the baubles themselves, each supplement also includes fully-playtested new rules and mechanics, outstanding presentation and production values, a torrent of premium-quality artwork, and extra materials designed to help you get the most out of the series. Additionally, Beginner Baubles are completely setting-neutral, ready to be dropped into almost any fantasy world that allows for magic items and objects. Best of all, adopting a completely modular approach, each entry in the series can be used as a standalone supplement or in conjunction with any others that you acquire. Beginner Baubles: Religious Regalia presents 20 holy and divine baubles perfect for use by the pious and devout. Clerics, paladins, acolytes, cloistered priests, exorcists, missionaries, and other people of faith will find a religious relic perfect for them here. Censer of Dragons' Wrath. This incense burning censer appears in the guise of three golden dragons and shares a strong affinity for the mighty beings after which it is styled. Clemency. This large, two-handed Zweihänder is used to fight evil spirits and safeguard the souls of those in jeopardy of being such blights upon the world. Empyrean. The only surviving relic of a great basilica that was swallowed whole during a great earthquake, this stained-glass shield serves as a bulwark for the righteous. Guardgoyle. This creepy gargoyle might seem like little more than an odd or unusual accessory, but, should its wearer find themselves in mortal peril, its true purpose is revealed. Ouroboros Chakram. Modelled after the fabled world-eater snake, this exotic and esoteric chakram introduces a new weapon type to 5th Edition, Chakrams. Whytewern. This curious shapeshifting armor serves as a perfect companion for a druid, although it has an unusual affinity for vitiligo and albinism. 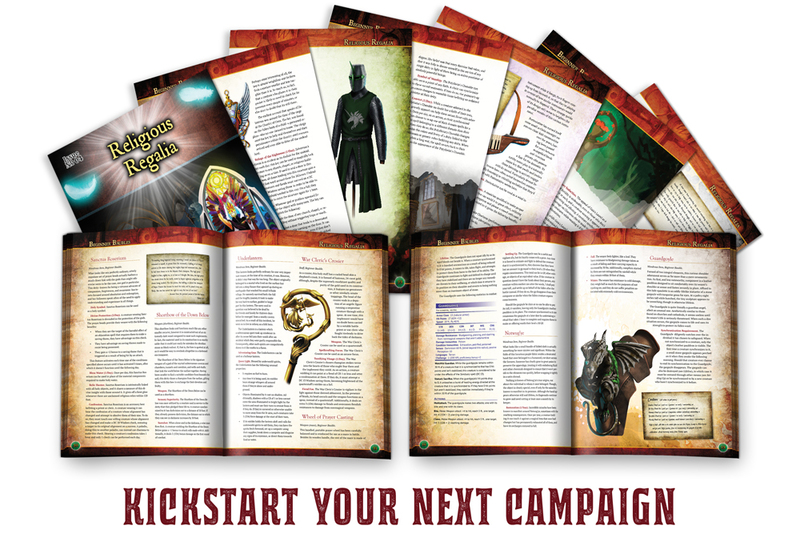 Even more player options are available from DeepDark Designs. 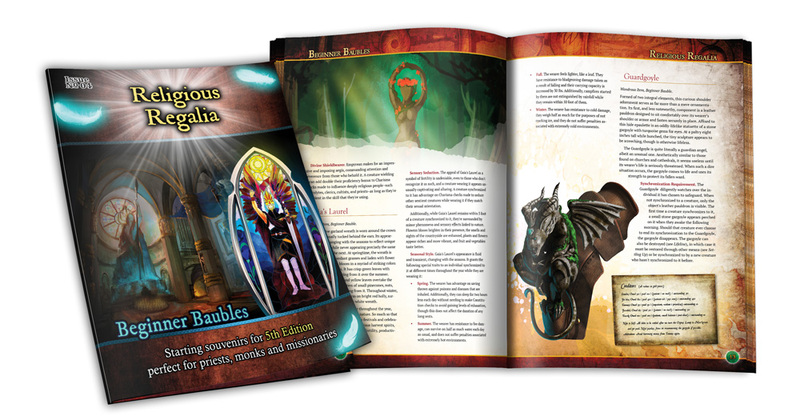 Check out Beginner Baubles Volume 1; Relics of the Realm a treasure trove of starting character items.